Here is a picture of Sister Dona. She was found innocent after 42 months in prison. 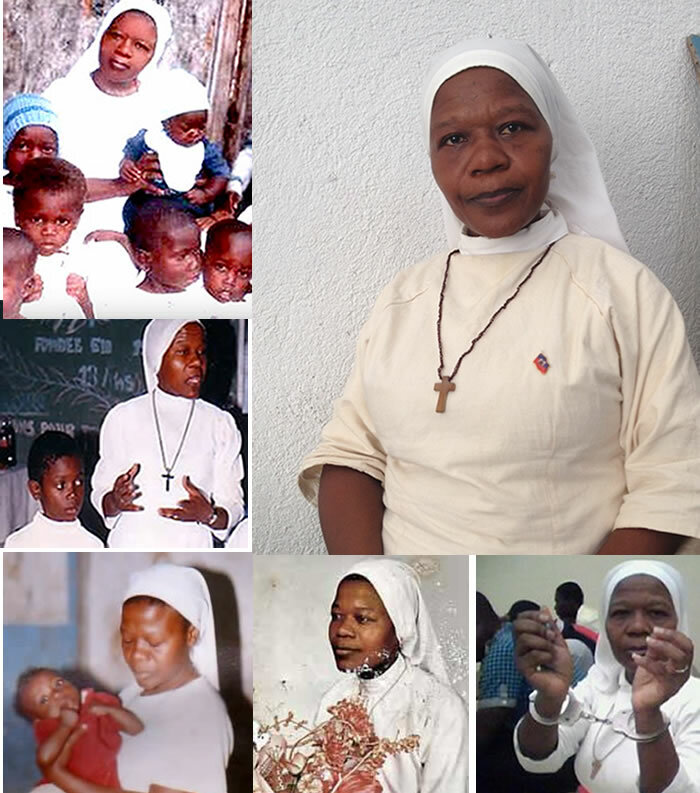 On December 17, 2015, Dieudonne Pierre Bélizaire, better known as Sister Dona, founder of the orphanage of 'Sisters Redemptive of Nazareth", has been cleared of kidnapping charges in a criminal court in Port-au-Prince, and was released immediately. Sister Dona was in the Civil Prison of Petion-ville since 21 June 2012 in connection with the kidnapping of a child named 'Raphaël Chenet' from her orphanage, a crime which she vehemently denied from the beginning. During the crime, as per report, she was not even in Haiti. As per Kenscoff Peace Court records, Djimmy Mémé, one employee of the orphanage, had confessed the crime on July 18, 2011; he took $2,000 from a couple (Péguy Blanc and Christine) who wanted to adopt Raphaël Chenet. Djimmy picked up the child from the orphanage and handed the child to Péguy Blanc. Most of these facts were confirmed by Djimmy's cell phone records and were noted in the Registry records of the Kenscoff Peace Court. However, Djimmy Mémé, the main criminal of the crime despite his confessions and facts, was released by the Substitute Commissioner of the Government, Rodriguez for unknown reasons. Haitian-born, Mother Mary, Oblate Sisters of Providence founder, has entered the final phase of canonization as the first black female saint. 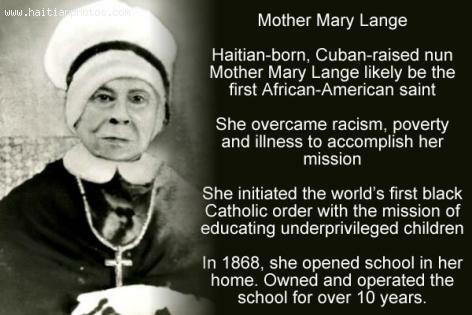 Mother Mary died in 1882 after a lifetime of service to African-American children. She established a private school for them and the first black order, the Oblate Sisters. Her remains have been placed in the Motherhouse in Baltimore. What remains for canonization is a Positio, enumerating her works for God, and proof of two miracles in her life. Pope Benedict XV appointed Mgr. Mesidor Diocesan Bishop of Fort-Liberté. Mgr. Mesidor took an oath of fealty to the Holy See Concordat, Article 5. Mesidor vowed ". . . to keep respect and loyalty to the Constitution of Haiti . . . for the . . . common good . . . and defense of the interests of the Nation"
Martelly said to Mesidor, ". . . you face a difficult challenge . . ." but ". . . (we will) struggle for the soul of Haiti . . ."
Pope Francis has named a new envoy to Haiti. 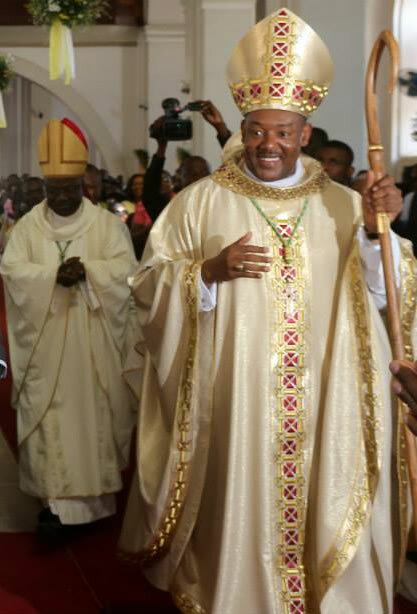 Archbishop Eugene Martin Nugent as papal nuncio to Haiti. The Vatican announced the appointment on Saturday. Pope Francis has selected Archbishop Eugene Martin Nugent as the 'Papal Nuncio' to Haiti as the new envoy to perform the significant works that remain undone to rebuild the nation five years after the devastating earthquake. A 'Papal Nuncio' (officially known as an Apostolic Nuncio) is the head of a diplomatic mission, a permanent representative, generally equals the ecclesiastical rank or an ambassador extraordinary with the full power of independent action on behalf of the Church. 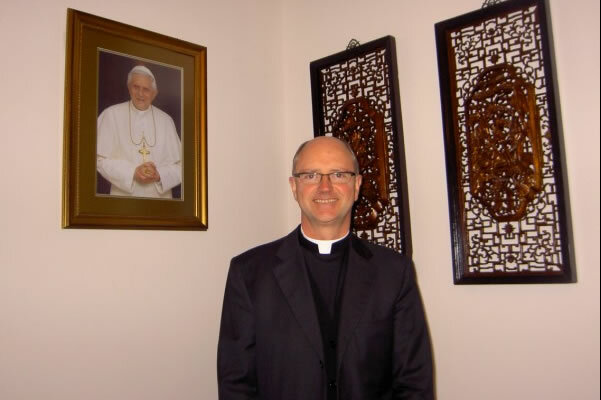 Earlier, on 13 February 2010, Nugent had been appointed as the Church's Apostolic Nuncio to Madagascar and Apostolic Delegate to the nearby Comoros Islands , and on 11 March 2010, he was named also as the Apostolic Delegate to Mauritius and Seychelles. Nugent was born in Gurtaderra Scariff County Clare, Ireland on 21 October 1958. The good work of the slain Father Jean Marie Vincent, assassinated by a flood of bullets in August of 1994, knows no bounds. As such, it was famously lamented by Claudette Werleigh, a colleague of Vincent's at the Catholic Relief Services, that not just one man had been killed by his murder. Father Vincent helped build Haiti by raising money and providing assistance for grass-roots groups. He aided farmers in finding overseas markets for their crops, did work with the poor and simply gave of himself plainly, often endangering his life for the rights of others. 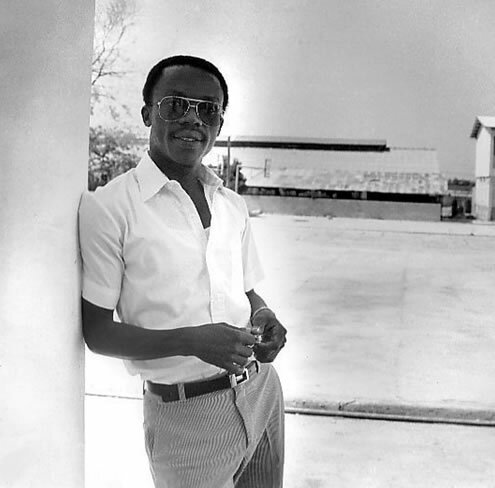 Here is a picture of the young Jean-Bertrand Aristide, former Roman Catholic priest who was born July 15, 1953. Jean-Bertrand Aristide (born July 15, 1953) became a priest and a favorite of the poor. 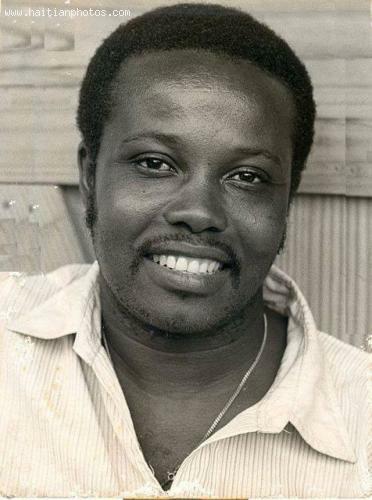 After the collapse of 'Tyrant Duvalier family', he was chosen as the 40th Haitian President in 1991 with 67% vote in Haiti's first democratic election. However, his first term as President was very brief and that ended with a military coup; but he became President again from 1994 to 1996 and from 2001 to 2004. In 2004, an American coup forced him to seek asylum in Jamaica and later, he was forced into exile in the Central African Republic and South Africa. After seven years of exile, he returned to Haiti on March 18, 2011 with his wife and two daughters. Before he became a politician, Aristide was a Catholic priest of Salesian order. Presently, Jean Bertrand Aristide has an estimated net worth of $800 million. On Saturday, 25 October, 2014 Pope Francis appointed Monseigneur Alphonse Quesnel, the SMM of the Province of Haiti, as the ordinary of the Diocese of Fort-Liberté. Fort-Liberté is a commune and the administrative capital of the North-East Department, Haiti, under the French rule it was known as Fort-Royal and Fort Dauphin, it is very near to the border of the Dominican Republic with a population of about 371,000 Roman Catholics and served by a presbytery of 48 priests and 68 religious. Monseigneur Alphonse Quesnel had been serving as the auxiliary bishop of the Archdiocese of Port-au-Prince since December 2012. After completing his probationary period in 1972, he started his profession as Montfort missionary. In July 16, 1977, he was ordained a priest on the Feast of Our Lady Mount Carmel. Bishop Quesnel is known throughout the congregation for his contribution in the work of formation and as a parish priest. The Cathedral of Our Lady of the Assumption is also known as the Port-au-Prince Cathedral, it was constructed between 1884 and 1914 and became the church оf the Roman Catholic Archdiocese оf Port-au-Prince on 13 December 1928. The church was almost destroyed in the 2010 earthquake. Prior to its destruction, the cupola of the north tower used to serve as the front lighthouse for guiding mariners into the harbor of Port-au-Prince. Monseigneur Guyre Poulard, the Archbishop of Port-au-Prince launched an international designers competition in the fall of 2012 to rebuild the cathedral. After scrutinizing a total of 134 designs, 30 finalists were shortlisted and the winner was selected in February 2013. The winning designer to rebuild the church was Segundo Cardona, a Fellow of the American Institute of Architects (FAIA). 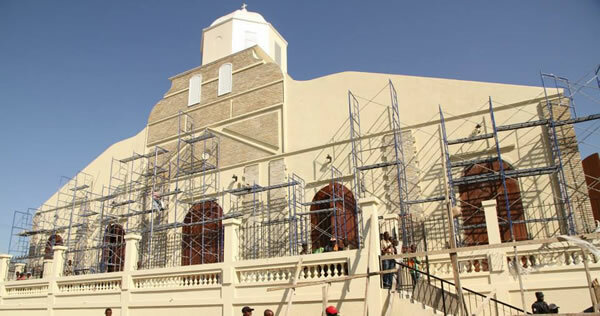 The main requirements for rebuilding designs included: (a) Preserving the remains of dilapidated structure; (b) Plan should be suitable for the rituals of the church; (c) Creating civic space for non-religious purpose; (d) Creating a space for remembrance of the 2010 earthquake tragedy. 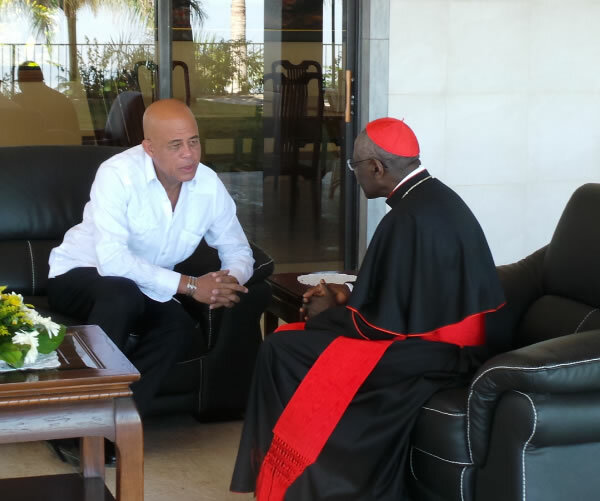 Cardinal Robert Sarah, who has been named as the Prefect for the Congregation for Divine Worship and the Sacraments, by Pope Francis on 23 November 2014 visited Haiti from 25th to 29th November, to show solidarity with the Haitian people who are still struggling to rebuild their lives from the 2010 devastating earthquake. 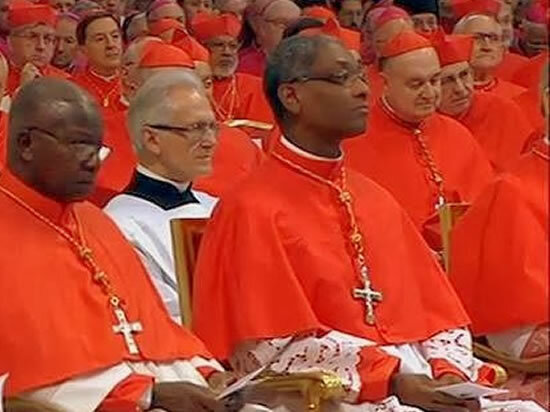 Cardinal Robert Sarah is the current president of "the Pontifical Council Cor Unum", the charitable arm of the church. During his visit, the Cardinal inaugurated the "Notre Dame des Anges", a school in Leogane, built with the financial assistance of the local Church and funds sent by the Holy Father since the earthquake. 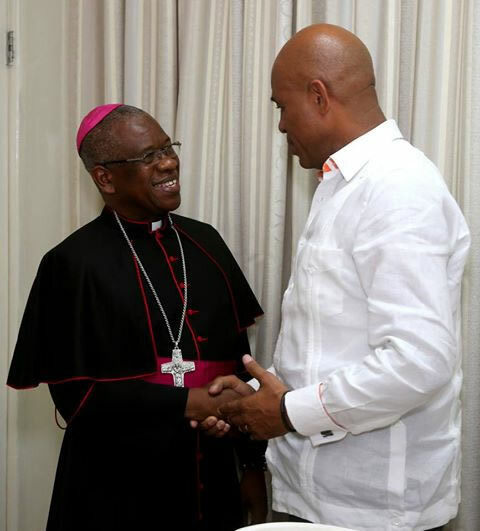 The Cardinal has appointments with the Haitian President, Msgr. Erick Touissant, president of Caritas Haiti, and representatives of humanitarian organizations and local authorities. The Cardinal's visit comes with an announcement made by the Pope Francis that he has convoked a special conference on Haiti for January 10, 2015, at the Vatican. The conference will ensure a spotlight on the earthquake related humanitarian catastrophe and Church's closeness to the Haitian people. Cardinal Chibly Langlois to celebrate Mass in Little Haiti, home to the largest Haitian community in U.S.
Mass in Little Haiti, Miami this year was a special service for all those who attended the November 23 event in what is the largest concentration of Haitians in the United States. This special service was made so by the presence of Haitian Cardinal Chibly Langlois, the Diocese of Les Cayes, Haiti. The yellow T-shirt-clad parishioners came out en masse to see Haiti's first cardinal, the youngest appointed in his batch earlier this year, and the only one not already an archbishop, a title he was honored with shortly after.